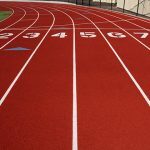 ACAC Boys Results ACAC Girls Results Last week, the girls won the ACAC Track Meet making them back to back conference champions. Our senior girls won conference 3 out of their 4 seasons. A change has been made to the schedule. The East Jay MS Track invitional will not take place on Saturday, May 5th. Sorry for any inconvenience.